In much the same way that college football should easily be able to amend the rule in which the clock can re-start in the final minutes of regulation even after a penalty committed by the offense (hello, Alabama-Arkansas game), the sport should also be able to tweak one aspect of its postseason for the 2015 season and beyond. October isn’t even half-over, and yet it’s nakedly clear that there are already few legitimate and appetizing options for the “Gang Of Five” representative in the six-game New Year’s Day bowl rotation. First off, it’s great that college football is giving the little guy an annual slot in a big bowl game. That’s enlightened, inclusive, and worthy of what is a national sport, albeit one with regional dimensions. You’re not going to get top-tier quality in bulk from the smaller conferences, but space should be set aside for the best of the bunch, and it’s good to give these teams an automatic “in.” Let that point be emphasized. Yet, with opportunity comes a measure of responsibility. If there’s no 2010 TCU or 2011 Boise State, no 2007 Hawaii or 2012 Northern Illinois, college football has an issue on its hands — not necessarily a problem, but an issue to resolve… especially as long as BYU does not have the ability to get an automatic bid to the Gang Of Five should it end a season as the highest-ranked team in the group. We’re looking at a mess in the Gang Of Five this year, though the severity of the mess is admittedly open to interpretation. The frontrunner for the Gang Of Five’s premium bowl bid is Marshall. 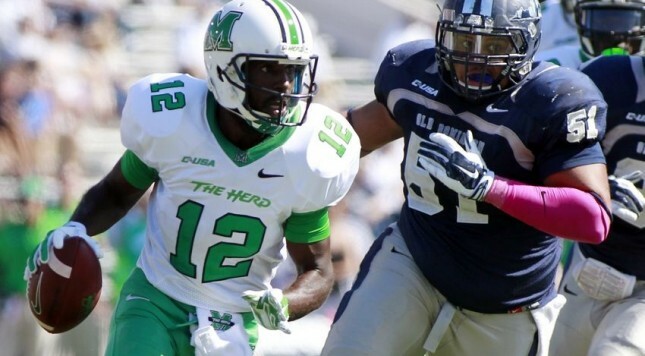 The Thundering Herd are in a very good position to win all their games. Going 13-0 is worthy of praise, no matter how weak a conference (Conference USA) might be. Why is Marshall the frontrunner, though? Only two other teams in the Gang Of Five have an even remotely realistic chance of being considered for the bowl berth. 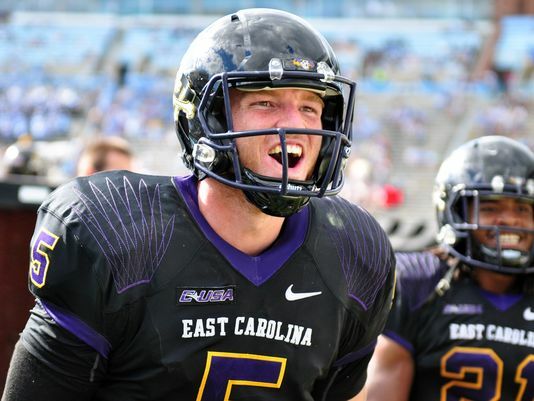 East Carolina has only one loss, and so does Colorado State in a weak Mountain West. If those two teams win out, they could get in over an unbeaten Marshall squad. If both teams finish with two losses and Marshall stumbles once, the Pirates and Rams would probably be the two teams left standing. Just to make sure here: The Mid-American and Sun Belt Conferences don’t have a single team with fewer than two losses. Temple, in The American, has only one loss, but the Owls haven’t beaten a team as decent as Virginia Tech (East Carolina). Memphis began to emerge as a possible contender in The American, but the hype was quieted before it had a chance to develop. The Tigers were upended at home by Houston on Saturday. They’re just about done and would be fully cooked if they lose one more game. UCF already has two losses, but the Knights would become a foremost Gang Of Five contender if they ran the table. They might still be in the conversation if they won The American with only a single conference loss and Marshall lost once. Still, the larger reality is that there aren’t many teams to choose from in the G-5. Moreover, of the ones that exist, the collection of resumes inspires very little excitement. Why is Marshall unlikely to make a New Year’s Day bowl with one loss? Look at the Thundering Herd’s schedule. Marshall’s toughest opponent on what would be a 13-game slate (including the Conference USA Championship Game) is Rice. That’s not the toughest conference foe — that’s the toughest foe, period. The Herd could win all their games without receiving more than one moderate-level test. Being given the honor of playing in a storied and lucrative bowl game should confer upon college football the responsibility to require teams to achieve something of appreciable stature. Beating Rice to get to January 1 against Alabama or Ohio State? Surely the sport can make Marshall win at least one tougher game to claim such a prize. As for the teams that already have one loss, it’s not as though either one has what could be called a genuine “high-end” scalp: Colorado State won at Boston College; East Carolina won at Virginia Tech, a team that subsequently lost at home to Georgia Tech. Colorado State’s loss to Boise State was diminished when Boise lost to Air Force (and handily at that). East Carolina’s loss to South Carolina initially seemed to be a quality result, but the Gamecocks’ tailspin has changed the calculus there. We — as college football chroniclers — keep running into this problem: Schools do not yet have (enough) incentive to schedule at a challenging level out of conference. East Carolina, of course, thought it was scheduling well, so the Pirates have to be given credit for that. Marshall, though, has clearly chosen the cupcake route. Nevertheless, discretionary scheduling versus mandated or imposed scheduling merits constant attention in college football. A conference championship game forces a team to play an additional game that is ostensibly challenging, but there’s still no mandated non-conference game equivalent. East Carolina should not be forced to play Marshall in a bowl game, the way Boise State and TCU were forced to play each other in the 2010 Fiesta Bowl. In order to reach a Fiesta Bowl-level stage, though, the likes of ECU and Marshall should be made to play each other in a framework akin to the basketball BracketBuster. Gang Of Five teams such as Marshall should be made to play at least one tough non-conference game. Teams such as ECU (which scheduled well) should go through at least one more non-conference test in December before they rake in New Year’s Day bowl revenue. One might look at the season and reasonably conclude that Marshall will finish 13-0, East Carolina 11-2. Let’s say that’s what happens. The Herd and Pirates would be the last two teams standing, barring a Colorado State surge to a 12-1 record. If Marshall goes unbeaten and ECU loses only one more time, fans of both sides would have an argument to make. Marshall fans would have the obvious and hard-to-refute claim that their team did what it was asked to do, what it was capable of doing. East Carolina fans could say that their strength of schedule was far tougher, and that with only a two-loss differential, their resume could stack up with Marshall’s. This leads us to our fundamental point: When there’s a resume comparison between a soft schedule and a rough schedule, it’s hard to lift the team with the rough schedule over the team with the soft schedule if the soft-schedule team has two fewer losses. A three-loss differential feels like a non-debate in favor of the soft-schedule team, and a zero-loss differential is even more of a non-debate in favor of the tough-schedule team. A one-loss differential merits debate, especially if the soft-schedule team is unbeaten the way Marshall might be. What makes the issue more complicated is that an unbeaten record in a Gang Of Five conference does not carry the same heft of an unbeaten record in a power conference. Yet, if East Carolina does manage to go 12-1, it would be hard to deny the Pirates their place in a big bowl, especially after 2013 American champion UCF showed so well against Baylor in the Fiesta Bowl. If 13-0 Marshall versus 11-2 East Carolina seems like the kind of scenario in which both sides have an argument, there’s a very simple solution to be found: Have the two teams meet in a one-game playoff at the end of the season. No, this can’t happen in 2014. It could, however, be installed for 2015, as this new postseason system learns what works and what doesn’t. You might be upset with this idea, but you shouldn’t be: This is NOT mid-on-mid crime, it should be noted. This is not akin to making VCU play Wichita State in the round of 64 in the NCAA tournament. The Big Dance is the showcase event, akin to the Fiesta Bowl. Having a one-game Gang Of Five playoff is like the February BracketBuster event that tries to weed teams out before the Dance and Selection Sunday. A one-game Gang Of Five playoff would ensure that the smaller conferences’ big-bowl representative would be the product of a win, not a political selection as was the case in the Bowl Championship Series (when a smaller-conference team was in fact selected). A one-game playoff would also send that representative into its bowl game as a more battle-tested squad. Wouldn’t that be good for college football? It just doesn’t seem that complicated… does it?